Canadian media and tech company BroadbandTV Corp. has just kicked off an open beta phase of Viso Catalyst, a web platform allowing YouTube channel partners to learn what’s working – and what isn’t – with their videos. One of the biggest multi-channel networks on YouTube, Vancouver, B.C.-based BroadbandTV launched the service in June 2013, making it available to closed beta users first. In doing a benchmark test, BroadbandTV found 1,062 randomly chosen videos using the platform had 34 per cent higher viewership over the course of 30 days, after content creators optimized their keyword tags and updated their thumbnails. The platform is touted as a way to make it easier for YouTube’s video creators to see how many views a video received, as well how much time viewers spent watching a particular video on YouTube. “We have launched VISO Catalyst to help all of our channel partners become more successful. it works with partners of all sizes, from smaller niche channels to broader appeal gaming and entertainment, it’s free of charge to existing partners. It can also be licensed to non-partners,” said Shahrzad Rafati, BroadbandTV’s CEO, in an email. Viso Catalyst shows a creator’s estimated monthly revenue, and it shows the most profitable choices a creator can make in picking video thumbnails and search keywords. The platform is also supposed to help creators engage with viewers, and it comes loaded with video deployment and customization tools. “[We have] compelling algorithms that can deliver outstanding results at scale for our content providers,” said Mehrdad Fatourechi, BroadbandTV’s chief technology officer, in a statement. 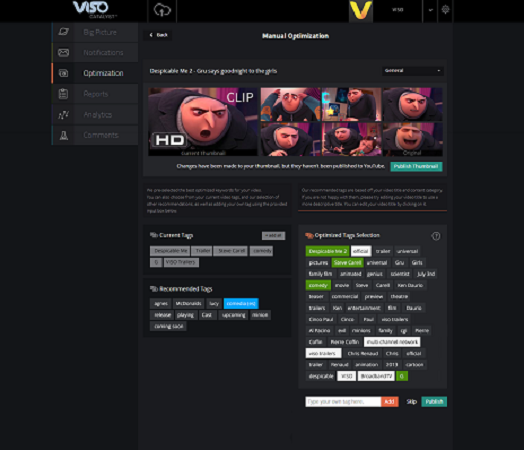 Viso Catalyst helps content creators pick the best tags for their videos. Besides providing the Viso Catalyst platform, BroadbandTV also manages content for major brands like the NBA and the A&E TV channel. It helps them generate revenue from fan-uploaded content. So far, 50,000 videos have already used the Viso Catalyst platform while it was still in closed beta. The platform is free for the 10,000 video creators who have already partnered with Viso.